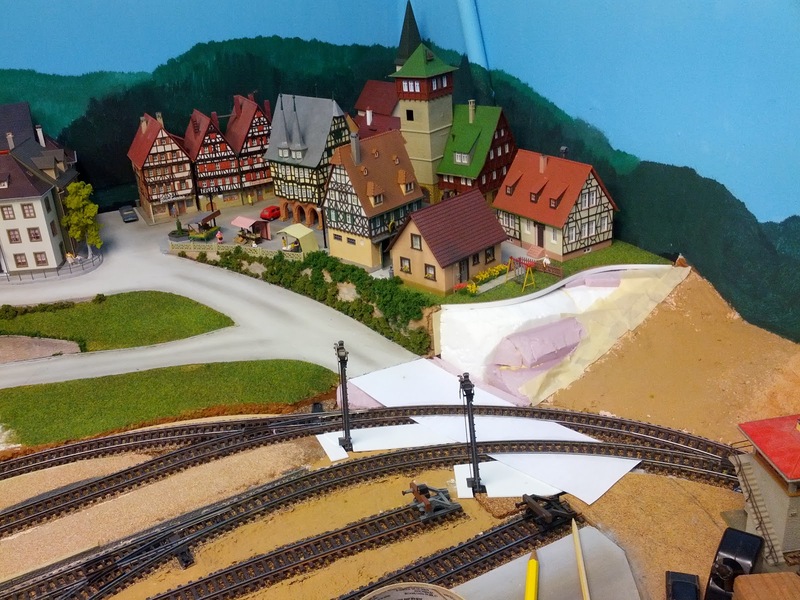 Today I dropped the town of Emsingen back into the layout. I wrapped up the detailing I had planned so far, and also was itching to do something else than work on the town. I decided to finish the scene to the north of town next. On the far side of the track this involves completing the orchard and the backyard garden behind the two village houses on the edge of town, and completing the scenery behind the Welzbridge all the way to Hochwald. 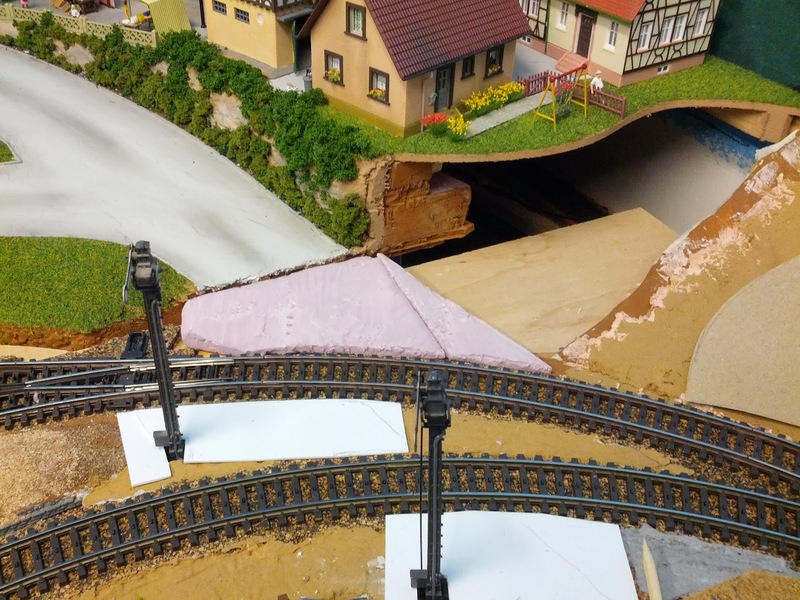 On the near side I need to build the railroad crossing the scenery on top of Tiersteintunnel, as well as detailing the road out of town. I built the land form from pink foam and styrofoam pieces I had lying around from earlier projects. I tried to hide the rather steep drop from the town module to the track as much as I could. It's still a bit steep, but doesn't look quite as horrible as I feared. In an ideal world this crossing will be protected with operational crossing arms. However, this might not work out since it will be difficult to mount a motor underneath, both because that area is hard to reach, and there are tracks and switch machines in the way. Due to the edge of the town module I have very little wiggle room. I was dreading building the actual road crossing until I realized that it shouldn't be a total mess if I built the road from styrene. Getting exact shapes of the tracks passing through the road was surprisingly easy. Lay a piece of paper over the tracks and trace the contours of the rails with the side of a pencil. The paper templates turned out very accurate and fit perfectly on the first try. 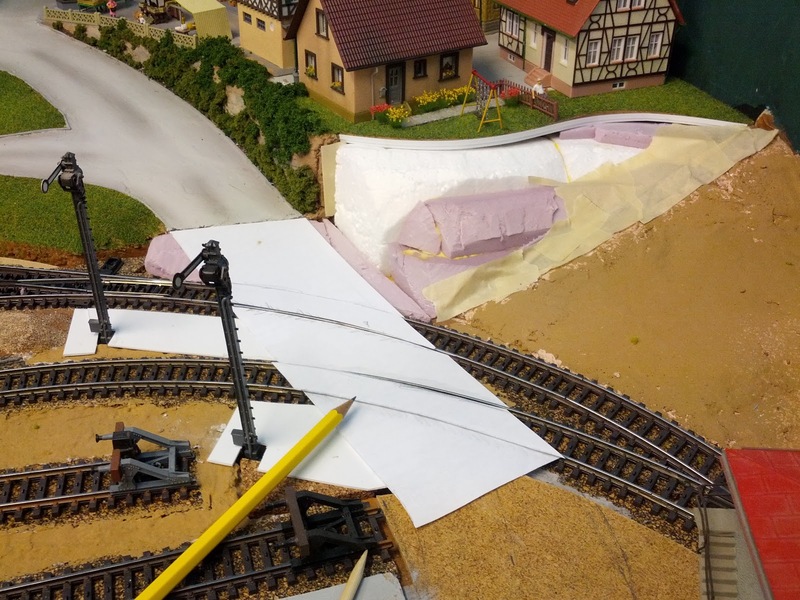 In the coming days I will cut the styrene shapes for the crossing and find a solution for the inside of the tracks. Maerklin's center studs make this an interesting problem.